Embassy Disguise is a rare Agility item card. It is part of the Heroes of Skyrim expansion. 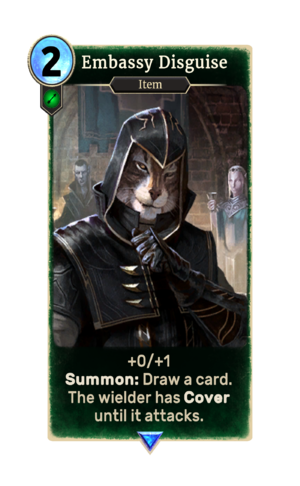 This card depicts the Hooded Thalmor Robes from Skyrim, which could be used to infiltrate the Thalmor Embassy in the quest Diplomatic Immunity.